Breakfast was included for this hotel stay, so it was nice to casually wander downstairs to grab breakfast, instead of carefully doing researching and looking for a breakfast place, while being super hangry. It was a buffet style breakfast with an assortment of fruits, breads, cereal, fried rice, some cold cuts, cheese, sausage, bacon as well as Pho. 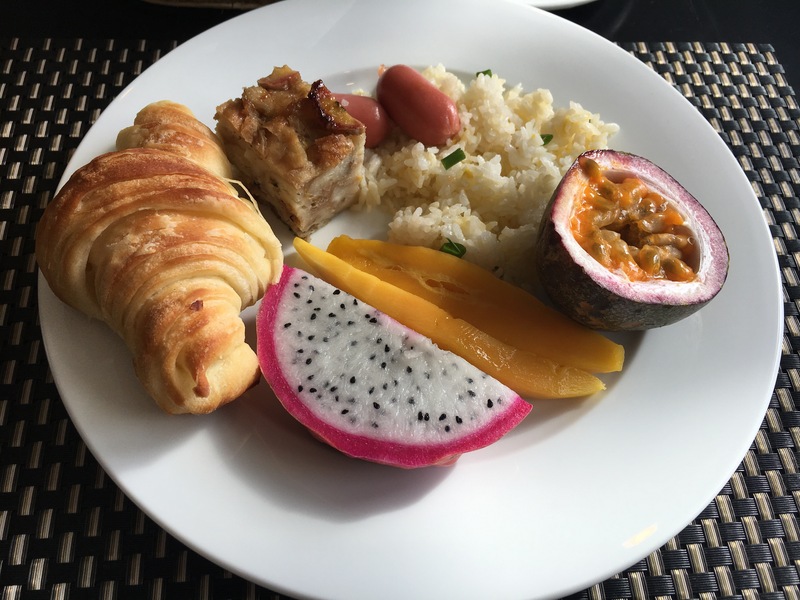 I took a croissant, some fruits and fried rice with sausages. We saw other people ordering eggs so we got some as well. I ordered an over-easy but probably due to miscommunication, it came back more like an omelette. The front desk was nice enough to notice I wasn’t feeling well and ordered some ginger, lemon, honey tea for me. Hotel breakfast. I was sad to find out that the passion fruit was very sour! After feeling awful for the last few days, we decided it was time for another massage! we found a spa with pretty good ratings called White Rose Spa near the old town. I decided on the head, shoulder and back massage, whereas Aaron chose something a little different – the “Indian head massage”. Again, I love the service at these spas. We were immediately greeted with some tea, and a nice herbal food soak. Then, we were led upstairs to the treatment area. I was asked to go change in a bathroom this time, so yay for privacy, but as soon as I came out, I had to take off my towel anyway, so nope, still no privacy. The sheets felt a little damp to me so I told my masseuse and she was like “but I just changed it”, then brought another towel to put over it. The massage itself was nice. It’s interesting how in Vietnam, they actually climbed onto the table to massage you. She started with the back, then worked her way up to my head. With my sinus pressures and all, I wish I got more of the head massage. Aaron really enjoyed his massage too, saying they massaged his whole scalp and face. Jealous! He even asked what time they close, actually considering returning for a full body massage later on. The price is slightly higher than in HCMC but still a bargain compared to Canadian prices. Because I was freezing last night, I decided to wear long black pants today. What a mistake. It was a nice, hot, sunny day and I was melting. We decided to sit down somewhere to get some work done before I melted away. The place was called Reaching Out. It was run by deaf-mute workers, so orders were taken using a order sheet and there were little cubes with words such as “Thank you”, “Bill”, “Hot water” to use to communicate. It was a very interesting experience. Aaron got a little too excited and ordered the 3-tea sampler, as well as a the cookie sampler and I got some iced lime juice to cool down. The tea sampler arrived on a nice tray with 3 sets of tea pots, 3 tea cups, a strainer and a cookie to pair with each tea! Then, the cookies arrived with another dozen or so cookies to try. Even my lime juice came with a nice shortbread-like cookie on the side. It was cookie overload! This was a place for relaxing and peace, but instead I was overwhelmed with the cookies we had to finish. I eventually decided it was not worth it stressing out, so I just ate a few, then let Aaron finish the rest. It’s time to visit some tourists attractions. Since we bought the “entrance ticket”, we had the option to visit 5 attractions. These ranged from temples, assembly halls, old houses, and museums. I was less than impressed when I was forced to give up one of these tickets when I walked across the Japanese-Covered bridge just to get to the other side. According to Rough Guides, the bridge should be free, only the temple was part of the ticket scheme. So we walked around the temple, which took a total of 30 seconds. There was not too much in there. Just one statue for offering. With 4 more tickets to go, we had to choose carefully. We read the Tan Ky House was “the old house” to visit, so we went there first. As soon as we went in, we were asked to sit down and was given some tea. Then the “guide” came over and quickly rhymed off a few memorized facts about the house, pointing at a few areas of the house. It was interesting to see the markers for water levels from the floods in the past, the most recent being December 2016, which I already saw from Youtuber Mina Oh’s journeys. It’s crazy how everything was all flooded just 1 month ago and it is all nice and dry now. In the house, was a pulley system to pull up all the furniture from the first floor in case of a flood. Our “guide” quickly brought us over to the souvenir section, tried to sell some things to us but as soon as she saw we were not interested, said the “tour” is done now. Well, that was something. We decided it was time to grab some lunch. Aaron choose a place called Nu Eatery. It was a very fusion, hipster-looking place. Foursquare recommended their Banh Bao Kep (steamed buns), so we had an order of that. Then we tired their Buoi Nam Roi (pomelo salad) and finally ending with the Com (rice). The steamed buns arrived and reminded me of the mini versions of the ones I would get at Datsun in Ottawa, or at Momofuku in Toronto, at a fraction of their prices here of course. 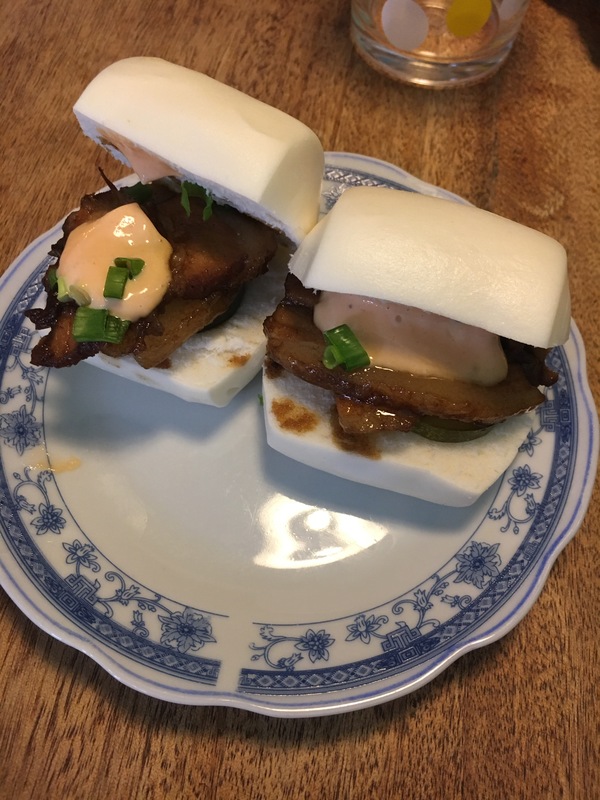 It was more simple than the ones at Datsun, but still extremely delicious, with the same basic ingredients of pork belly, veggies and spicy mayo. The pomelo salad was an interesting dish, which Aaron really enjoyed. The pomelo was accompanied with some calamari, opinion, green apple and peanut butter! The dressing, which was more like a sauce had quite the kick so be careful! Finally, the main was my favourite part of the meal. The sesame chicken was so tasty, whereas the green mango and coleslaw made the whole dish less heavy. It was amazing. Overall, very good meal. The quality is like something I would get at a good fusion restaurant in the booming areas of Main street in Vancouver. We then checked out a few assembly halls, including the Phuoc Kien, supposedly the most elaborate; Trieu Chau, to pay respects to my maternal ancestors; and the Cantonese, to pay respects to my paternal ancestors. They were all pretty much the same, huge Chinese arch on the outside, a few statues to pay respects to on the inside, with a courtyard for gatherings. There was a washroom facility in the Phouc Kien one. Remember to pay or the washroom lady will chase you down with a death stare, yelling “Hey! Money!”. Oops, there was no sign. Sorry! Overall, my ratings for the tourist attractions was 1/10 – disappointed. If I had the option to not purchase the “entrance ticket”, I wouldn’t bother. Although, good luck with running away from people trying to get to buy or give them your tickets. It was time to cool down again so we stopped at CocoBox for some ice cream. We are very confused because as soon as we sat down, they gave us a Hoi An Roastery menu. I guess it’s owned by the same person. We got a nice table with a river view as promised by the signs downstairs. It was quite a nice way to wind down after a day of sightseeing and before our next mission. The mission name: finding a new luggage. So the story goes: I found out I had a couple of holes in the back of my suitcase as soon as I arrived in Hoi An. The rest of the backing was kind of falling part with the spine of the suitcase wearing down the fabric. Aaron suggested just taping it down but I was worried, given we are still traveling for quite some time. We briefly looked last night but were too tired to put in too much effort. Today, we looked around a quite a few luggage selling shops (and there were quite a few), but did not find the same one as the one I really liked last night, so we went on a journey to try to find that shop again. It was not easy as things looked different in the daylight and all the streets seems similar with same type of shops here. Finally, we found it! We picked out the colour we liked and I’m off with a new suitcase. So the bargaining process went like this. Last night, when I came, I just asked her for the price out of curiosity and she listed 850,000 VND (~$50 CND). I said ok, I’m going to walk around first. Then she started throwing numbers at me, which went lower and lower, and eventually she said “ok if you come back 700,000” (~$40 CAD). So today I offered 600,000 (~$35 CAD) but she, of course, saw my interest in it enough to come back so she wouldn’t give it to me. I was also really tired already from a long day, so I just paid the 700,000. When I brought the luggage back to the hotel. The lady at reception was really in love with the suitcase. She kept looking at it, commenting on the colour and touching it. She asked how much it was listed for and she said as a local, she would probably be able to get it at 550,000 VND and that I could’ve tried to get it at 600,000 by walking away. It was just so hard to do that when I really wanted it and the vendor saw my weakness. Haggling is one of my least favourite part about visiting Asia as it really does not fit with my personality but I guess “When in Rome, do as the Romans do”. At the end of the day, it was only a matter of saving $5-6 dollars on my end v.s. gaining a lot for the locals. Old suitcase, meet new suitcase. You have failed me. Goodbye. After taking a quick nap, we headed back into the Old Town for some dinner. Aaron chose a restaurant specializing in seafood, since we did not really have any since arriving in Vietnam! We started with some Cha Goi, which was the most nicely presented Cha Goi I’ve ever seen. Each was individually wrapped in raw lettuce and other vegetables already. The wrapper was also very different, made of super crispy threads instead of a whole rice roll wrap or spring roll wrap. Very interesting. For our main course, we had their seafood hot pot. It was a little pot, but meant to hold all the seafood and vegetables placed in front of us. The seafood included red snapper, squid and shrimp. 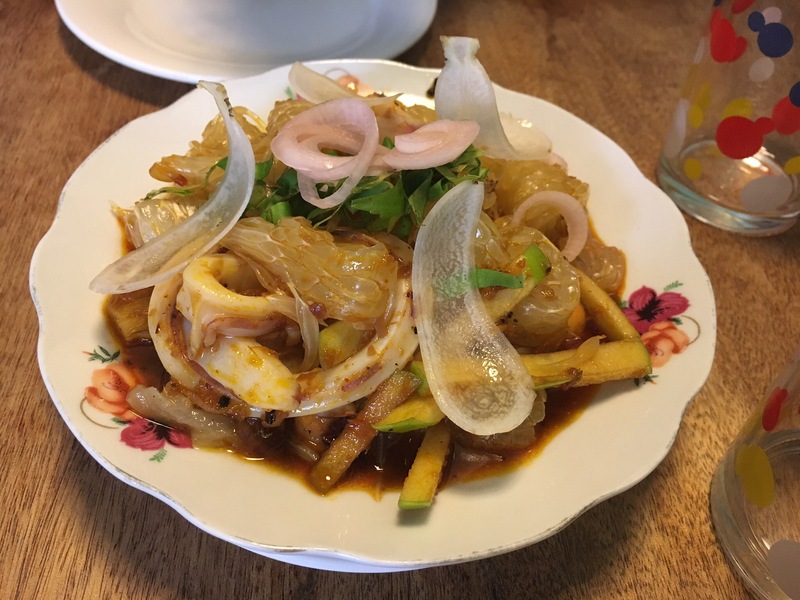 Then there was another huge plate of all sorts of vegetables (such as lettuce, cabbage, beansprouts, tomato) and miscellaneous items, such as noodles and even pineapple. 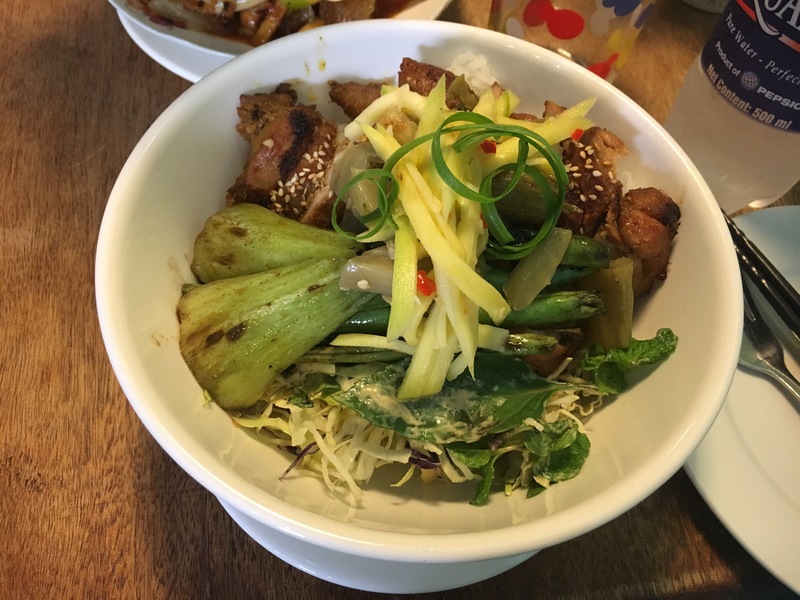 I appreciated that our server did all the cooking for us and then we were served bowl-sized portions. The broth was very light allowing us to enjoy the taste of the individual goodies in our bowl. The seafood all tasted really fresh and we especially liked the red snapper. The vegetables and noodles were good as well and the pineapple actually worked quite well with the dish. Overall, a pricier, but pretty healthy meal allowing us to really appreciate the quality of the seafood here. Hotpot @ Mai Fish. Photo credit: Aaron. We decided the end the night with some shopping at the night market. This time we were ruthless with our haggling, getting items at 30-50% discounts on their original prices. The food stalls were sad and quiet, so we didn’t get any food. We just walked around, appreciating the beautiful lanterns and the random, assumed-to-be wedding going on in one of the nearby side-streets with loud music. It was a nice way to spend our last night in Hoi An. So, do I feel that Hoi An is “the food place” of Vietnam. Not necessarily. Don’t get me wrong, their food was very flavourful and the restaurant here provided us some good fusion options, as if they “cleaned-up” their local dishes for us tourists. This is very different, than the authentic, not fancy, only-one-thing-on-the-menu options in HCMC, which I actually prefer.